As if this recession wasn’t hitting home enough, I spent too much time soaking in news this week – something about 600,000 people losing their jobs weekly? What was that? As if people who CAN pay their mortgages, and invested in "responsible" ways weren’t feeling punished enough, Obama’s administration is cutting out mortgage interest deductions? Did someone say that? That was surely a joke. No one would decrease the incentive to own a home at a time when housing starts are down and the economy is in a tailspin. Nah, I’m not buying it. I turned it off. I already wrote something recently about “Just because you can, doesn’t mean you should.” I think my example was f@rting in the bathtub, but sometimes I’m not sure if writing a political piece would be much different. In any case, my economic woes being what they are, I decided to put my soapbox on eBay to offset my losses, now that I won’t be able to deduct my interest. Instead, I put on my pink jeans. Aren’t they cute? Back in November, in some sort of twilight-zone experience, my husband flipped through the channels and landed on Entertainment Network. I saw this piece on movie stars starting the trend of wearing very tight, colored jeans. You can imagine what state of mind I must have been in, because I thought they looked pretty good. Since my Christmas budget was tighter than their denim, I simply moved on coveting these items – like any good American would, after all. I saw $8 denim at Walmart. They were in junior sizes, but they fit me really well (which might explain the $8 price tag?). They didn’t even have that annoying gap in the back that has caused me to leave even expensive denim on the rack. They fit great. When my husband walked in a few evenings later, I was boiling something on the stove. He came over to admire my work – hoping for something delicious. So, you might say, these denim jeans are even worse than just your typical fashion error. I went out of my way to cause this to happen. I bleached them. I boiled them in dye. I even altered them this morning to fit a little better through the thigh and tuck in my boots. I think they are perfectly awesome. My pink pants brought me a great deal of sunshine on this rainy, cold, recession-filled morning. I know, I know, go ahead and google ‘pink denim jeans’ and every site on the internet will tell you that I absolutely should NOT wear these pants. Well, as soon as my pants become society’s biggest problem, I promise to stop wearing them. I’ll even refrain from giving them to charity - because I wouldn't want to burden anyone else with my fashion disasters (anyway, I hear charitable deductions might be eliminated too). ps. Just in case you don't believe me - this is a close-up of the L.E.I Brand tag from Walmart. pps. Indy took the picture at the top. Only another blogger would recommend taking a picture of pink denim in the coffee shop parking lot on a rainy morning. pppps. I can't imagine why Cleveland.com didn't want ME to be the fashion writer. I just can't imagine. These people have no sense of style, clearly. I flew out of my house, into the snow, waving a long piece of beef jerky. “Crisis averted,” I heard my neighbor call from my driveway. We laughed. She isn’t a ‘dog person’ either. I did. I tried to chase a dog this morning. Dogs may well be ‘man’s best friend,’ but they aren’t typically my favorite creatures. Oh no, that’s fine if you have one, just don’t bring them into my house. The truth is that my friends with dogs always ‘put them away’ when I come over. I know, they will politely say it’s because my children are afraid, but everyone knows that I am the problem. I try to fake it for my kids (they think I like yogurt, trail mix, and cauliflower as well – shhh!) There is a golden retriever who comes to the bus stop with her family. I know it’s a golden retriever because my best friend in high school had one. I never had to get very close to her dog because I didn’t have any small children to impress, but I do happen to know that particular breed (and they are very nice dogs, well, for dogs anyway). The other types of dog breeds I know include Large, Medium, and Small. I have gotten close to, and even petted, the dog at the bus stop, just enough to convince my children that Mommy isn’t afraid of dogs (and you shouldn’t be either, see?). I doubt they bought it, but I do try. George loves animals. I am hoping to foster that love, in spite of my personal dysfunction. We read books about animals constantly. He particularly loves horses. Just yesterday, we were reading “Big Bird’s Day at the Farm” for the first time. He was really enjoying the story and pointing out the animals. He would even pretend to “count” them – one, two, one, A, B. Then we got to the part where Big Bird was talking to the chickens. That’s right, he wasn’t eating the chickens, he was talking to the chickens. Apparently George loves animals in an instinctive, hungry sort of way. But, I digress. We were all waiting for the bus when a teenager appeared in front of her home across the street with four or five dogs. Somehow, one of the dogs became loose and started running and jumping back and forth across the street. This white, curly-haired, Medium dog could not be seen very well against the snow covered street and traffic was relatively heavy in our neighborhood (especially buses) at that hour. I fully expected to witness this playful creature’s end. Seeing the teenager across the street with her hands full, and my other neighbor restraining his own dog, that left the other ‘not dog person neighbor’ and myself to go chasing this Medium dog. I tried to catch the collar, but it just wasn’t working. I chased the small beast several houses down until we were at my own house. Not having much success, I decided to run to the other side and ‘flush’ the animal towards the other neighbor, who might have a hope of catching the dog. The ‘not dog person’ neighbor then asked if I had any food in the house that would be useful, so I ran in to get a stick of beef jerky. By that time, the teenager had driven over with her car and the dog (apparently a travel-buff) ran and jumped in with her. For my part, I was pleased to not have to share my beef jerky. Oh, and also glad that the dog was safe with the girl. When I walked back in my front door, Gladys was there, her own happy curls bobbing towards me. She made off with my beef jerky. She loves animals too, especially the beef kind. I scurried around the kitchen, half listening to the murmuring in the background. My house overflows with questions, declarations, ultimatums, hypotheses, and even a bit of nonsense. My absent-minded parenting strategies generally leave me with answers that sound a bit like the fortunes in one of those old black fortune-telling balls I had as a kid. You remember, shake it up and one of a half-dozen possible answers would appear. “Oh, really?” My mouth answered before I really heard the words. “A piñata that looks like a person. Wouldn’t that be funny?” he giggled. In a moment that might be described as parental over-reaction, my brain began playing the song “Strangefruit.” I felt my coffee creeping back up from my stomach. Did I say that calmly? My mind raced around, listening to “Strangefruit,” grasping for a reason to whisk away the idea without a breakfast table discussion of horrifying American history. Surely, he had no idea of the connotation here. It had to be a fluke. I saw a person piñata hanging from my tree, with giggling six year old boys and horrified parents. “You! !” he laughed, in a way that made being hung in effigy sound like a great honor. Of course he didn't understand the connotation. It was all me. That didn't make it any better of an idea. “Oh! I get it,” I said, still not really getting it. “But, even so, the idea of piñatas is to break them open and I don’t like the idea of hitting even a pretend person with a bat. We don’t hurt anyone, even if they are pretend.” I love listening to my words some days. Did I just make a serious comment about pretend people? “It’s called a divorce,” I said, quickly wondering why I said it. I have to admit that I was surprised. There are plenty of kids in his class with divorced parents. This couldn’t be new to him. “Lots of reasons, I guess. But, your father and I will never do that.” I am summarizing here. I dislike these conversations. I always feel on the spot – not wanting to mask the ugly truth too much, but not wanting him to cry himself to sleep next time his father and I have a mild disagreement. Towards the end of the dialogue, I heard myself say it again. On Tuesday, I was particularly relieved to see him get on the bus. I craved the days of mere physical exhaustion. As the kids get older, I live through these sporadic pop-quizzes, as if walking into a defense of my PhD dissertation, without ever having contemplated a thesis. I walked back to the house shaking my head: a person piñata? Really? That evening, my husband worked late and I helped Andrew bathe. Another shake of the fortune ball, and the new phrase from my ongoing dissertation came in handy. I am currently having a 'giveaway' on my cleveland.com/parents/ site. Please click over there to check it out. However, the commenting system is not working well, so I will also be accepting comments on this site. Note: The prize is a $50 gift certificate to a restaurant on the East side of Cleveland, so if you aren't local, I wouldn't bother. “Where should we go for dinner kids?” I asked one evening. It was a special night. “I don’t know, as long as it is a ‘white tablecloth’ restaurant. Remember, Mom, I don’t like fast food,” replied Andrew (6 years). “How about ‘different country’ food!” chimed in Gladys (4 yrs). I shook my head, with a disbelieving pride. We don’t eat out as much as we would like, but my husband and I do love to dine. We always have. I remember the week we spent in Hong Kong – we decided to dine in restaurants specializing in a different region of China every night. On our eight-week trip out West we ‘refused’ to eat in a chain. That was interesting at times, but well worth it! Many of our outings are slightly less exotic, but my children have been invited behind the scenes to see tandoori ovens, a Lebanese bakery, and have enjoyed live music at restaurants where they were the only kids. Those are some of my favorite memories. 1. Start easy and fun. Bravo! is a great place to start. 2. Make it a celebration of the kids. 3. Encourage the children to dress their best, but don’t make it fight. 4. At first, keep it short. Order quickly, and let the waiter know your timing. 5. Take an early seating/ reservation. Kids who are not hungry and tired do much better. 6. Make sure everyone is comfortable, including the kids (consider sleeves in summer). 7. Bring back-up supplies if you often need them: a booster, sippy cup, a couple straws, and wipes. (Leave the booster in the car. You can get it if needed). 8. Go easy on toys. One matchbox car, four crayons, and one mini notebook are more than enough. Leave toys that make noise at home. 9. Make your children part of the action. You are teaching them how to dine, so look through the menu together, discuss fork placement, and check out the décor. (Enjoy a conversation with your spouse later). 11. If possible, have your children order their own food. The younger ones will feel SO grown up. (I think my oldest was two when he figured out how to get refills). If you have made it through dinner (even if it wasn’t quite perfect) congratulate yourselves with dessert. (Yeah, the DQ drive thru is just fine). 1. If you are nursing (I did), a beautiful silk scarf draped over a shoulder can improve everyone’s comfort (and you’ll look great too). 2. Even the nicest restaurants will bring out water-for-tea that you can use to warm your bottle. Put a large cup in your oh-so-stylish diaper bag in case they don’t have something large enough for your bottle. Practice the technique before you go. 3. Make sure the diaper is fresh before you enter, not all nicer restaurants have changing tables. If there isn’t a table, use your car seat or stroller (or front pack if you walked in) to change the baby in the powder room. My friend Angela at mommybytes put up a series of quizzes on her blog, which she found over at a blog eat blog world. Since this managed to use up my time that I should have been using to write, I will show you the results of my quiz taking. The Myers-Briggs test puts me exactly where I have always been. Of course, I don't mind keeping company with Margaret Thatcher, Roosevelt, or J.P. Morgan, so why change? I am not a tarot card sort of person, but I did the test for jollies anyhow. The quiz tells me I'm a "Star" - Hope, expectation, bright promises. Since when do I do quizzes? I definitely need a vacation. As the guests arrived, I hugged them one by one, taking them in, accepting their birthday wishes: friends. I desired to squeeze them a little longer, invite them for coffee, and listen to the lines on their faces. These mothers of 50 or more children lived so many lives in the past months, lost mothers, illnesses, personal tragedies that we know as ‘run of the mill,’ - that is, until we see the chafes and scars left behind by those millstones. But, tonight was specifically not about millstones. I waved my magic wineglass, hoping to change each of those millstones worn into the beautiful silk scarves that should adorn their necks, cradling their loving cheeks - only for a few hours, I know, but for my birthday maybe I could give them each a few extra hours of love. We were about ready to play dominoes. I filled my glass of wine. The preschool parking lot and PTA meetings transformed into a wine commercial. Curly hair had been straightened, straight hair round-brushed to perfection, make-up applied – a little more than usual - favorite jeans, and the top that accented this and minimized that in just the right way. Everyone smiled and laughed, the hand gestures threatening to topple a precarious glass of wine, a fruity vodka drink with a curly straw (?) (more laughter), a symbolic mockery of our daily lives twisted into celebration. Above the background of laughter, exclamations demanded attention. I looked across the island of gorgeous service pieces filled with delightful nibbles that multiplied with the arrival of guests. 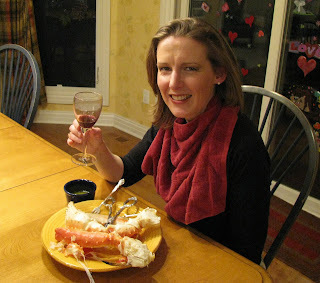 I saw Alaskan King crab legs. I stood still for a moment, the laughter becoming white noise in the background of my thoughts. I felt the softness of a gold velveteen jumper my mother had made for me, my hair in braids, we sat in a restaurant my parents could probably ill-afford at the time (I didn’t know that), eating Alaskan King crab legs for my birthday, my favorite food. I sat straight, a princess eating like a king, my kingdom perfectly orchestrated by loving hands, gifts given in one century, but not fully received until the next. I heard my own voice. I feasted on her thoughtfulness, dipped in drawn butter. We were about ready to play dominoes. Someone filled my glass of wine. No longer early, we moved the party to the hearth room to admire the carefully wrapped gifts gathered beside the roaring flames. “How should we start?” Mrs. Debutante asked politely. As the very last to pick (not the oldest, just the birthday girl), I stood before the fire with the daunting task of choosing a gift to “steal” from a friend. I walked around the room, fawning over them, realizing that each one was more perfect than the one before. The woman who had disappeared for a phone call (and emerged with a six-pack and the idea to send our kids into Lake Erie without bathing suits) held a bottle of Bailey’s. I moved on. Rightfully so, the “naughty gift” exchanged hands the most. (My side still aches thinking about it). The woman who would soon leave on her maiden voyage to Vegas with her husband emerged victorious – and who would argue? Victoria, who made her own Christmas cards at a girlfriends’ weekend and, seeming to appear whenever someone needs help (but has never been a recipient from me), received beautiful cards and a bookmark with a quote from Maya Angelou – perfect. The hostess to our crane party, brought an origami kit. The room erupted with laughter and fond memories. “Every exchange needs something goofy,” she offered excuses, but it exchanged hands multiple times before settling with our friend who received the cranes – so perfect! In awe, I absconded with a drive-thru gift card – the perfect gift for a woman on the move. We talked about playing dominoes, but the thought became lost amid the laughter again. My wine refilled, I noticed Mrs. Debutante swaying joyfully to the music she had just selected. She beckoned me over. “Yes, I remember,” I said, hearing it differently now as a song instead of a poem. Although the compliment was far more than my shoulders could bear, I accepted it. I wrapped it around like a beautiful silk scarf and swayed along with her. We never played dominoes. We forgot to care about anything besides each other. When the second to last guest departed, Mrs. Debutante sat gracefully upon her countertop. I popped up next to her on that granite throne, a princess in Harley boots, her kingdom made perfect by loving hands. I stood at the bus stop this morning. “Good mor,” I squeaked to a neighbor. “Feels. 40. tive. 10 chill,” in a bad cell phone service sort of way. “Hasn’t it been two weeks now?” my neighbor said, politely framing it in a yes or no question. I nodded this time. The Dayquil has become part of my morning routine. Wash face. Moisturize. Brush teeth. Dayquil. Coffee. Kid on bus. Somewhere, locked inside the congestion, cold remedies, lack of sleep, and caffeine, my mind wandered. Maybe I should see a doctor. Me: “Oh, a bit of congestion, headache, cough, runny nose, and a lost voice.” (I squeak clearly in my vivid imagination). Happy MY Birthday to YOU !!! I know, at a young 39, I'm probably supposed to stop celebrating. Standing in the rain at the bus stop this morning, we were all so down - lost jobs, sickness, sloppy snow. So, I did it. I announced my birthday at the bus stop. (Everyone left happy - including me.) Remind me why people don't ever tell me its their birthday?? Oh, yes, I'm the type to walk around with a birthday hat on . . . it's MY BIRTHDAY. C.E.L.E.B.R.A.T.E. with me. Darn it. And, why not? So, besides throwing a big party for myself on Friday. In which, by the way, none of my friends are allowed to do anything besides grab a bag of chips and a bottle of wine as they run out the door in whatever they are wearing - no PTA agenda, no HOA agenda, no service project, no product to buy, nope. They have been asked to bring a gift ($10). No, no, sillies. We are having a gift exchange. Not gifts for me, please. I demand that you don't. Why? Because I want everyone who comes to this party to think about doing it themselves. Have a party. You see, if you bring a gift for me, then someone might think that THAT is the point. What kind of person would WANT to have a party and have people bring gifts for them? That would be awkward at best, and probably downright rude too. My party on Friday is everyone's birthday. Get it? We are all celebrating. We will all leave with a thoughtful little something after having done nearly nothing and sitting around with friends all evening. Ha. That is what I want for my birthday. (Oh, and a big sloppy cake from my kids -- and the sloppy kisses from my whole family to go along with it, and my brother and sister HAVE to sing to me, otherwise I just can't get older, but thats a post in itself.) Okay, I'm a little high maintenance. I'm a big girl now, I can take the truth. And, since I cannot be with ALL of my friends on my birthday, I thought I would mention a few of them here too. So a very Happy MY Birthday!!!!! to a couple of my "oldest" bloggy friends . . . I want to wish Badass Geek a "Happy MY Birthday." Because, without him I might not be blogging anymore. Serious. Not only is he a fabulous writer, but he brings just enough smiles and my occasional fix of modest blushes. (tee hee). Splodge, yes dear, you too. I still smile to think that you practically yelled at me over e-mail because I had my blog permissions set wrong and you couldn't post a comment. What a wonderful compliment, especially from such an awesome blogger. Flea, yes, you too. 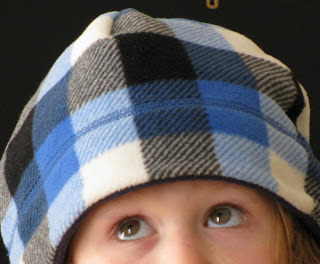 There just aren't that many of us who love fabric as much as we do, and you have opened my door to new bloggy friends. Indy & OhMommy - It was the glass of cabernet at Indy's home and Ohmommy's "oh, you SHOULD blog" comment that got me started. I can't believe how much I just didn't get it. And, finally, Brigette - who writes from the heart on topics I just don't have time to research right now, but really should. You get my feathers in a ruffle, and I LOVE that. Also, it does seem that I have a few lurkers out there. I would love to meet you too, so if you would kindly leave a comment, I would appreciate it!!! Thanks . . . . Happy birthday to me! Happy birthday to me . . . .
Last week, my son returned home with a rather disturbing drawing, and a story to match. He is in first grade. In a mild panic, I called my sister. “So, what do you think?” I asked. Oh. Right. I had this creative writing teacher. Who, in spite the fact that she was probably well educated and well intentioned, had been transformed by my pre-teen angst into a dumb, nasty, witch. Our assignment was to take four half-sheet cards and draw four watercolor pictures of the four seasons. For each season, we were to write a haiku. I thought this was a colossally stupid, dumb and BO-ring idea. (Imagine me with my hands on my hips with some 12-year old scowl on my face.) Of course, I didn’t actually put my hands on my hips and make a scowl, I just decided to be obnoxiously obedient. I decided to draw four very BO-ring (exactly the same) drawings. I would change the colors for the seasons, but that is all. I would write four very light and sappy haikus. Because, I thought the teacher’s brain was light and sappy and she would probably even LIKE it. Fine. Winter. I drew a white landscape, a blue sky, and a small, leafless tree on the right side in the distance. I wrote a sappy haiku about a stark, lonely, and beautiful winter. Spring. I drew a green landscape, a blue sky (with openings for white clouds), and a tree with leaves on the right side in the distance. I wrote a sappy haiku about budding leaves and the beauty of spring. Summer. I drew a green landscape (with a little brown), a blue sky without clouds, and a tree with leaves on the right side in the distance. I wrote a sappy haiku about a happy summertime. Fall. At this point, I had no interest in spending time drawing different color leaves. I drew a dark purple landscape with an orange-yellow sky. I drew a leafless tree on the right side in the distance. I decided it was late Fall. Fine. Done. As I was touching up the landscape, a big blob of dark paint fell from my brush onto my beautiful orange sky. In a panic, I quickly picked up the card, and watched the big gray blob of paint drip down to meet my landscape. Nuclear mushrooms, Blooming on the Autumn plain, Take claim on the world. Ha! Done! I turned in my pictures with Autumn at the bottom. And, within a few days, my mother received a call from the school wondering why her daughter so cheerfully predicted the end of the world . . . .
My son’s picture remains on our refrigerator. And, on the right side in the distance, I hear my mother’s laughter. With reverence and apologies to Edgar Allen Poe, again. I wrote a simple blog that I had not thought about before. My mom and dad could be reading, they just might expect some more. Just a journal I am writing, like in pen I wrote before. Now the mem’ries we are making, more sweet pictures I am taking. Those memories not lost to time as they were a month before. To new blog friends I am linking; linking to friends I adore. I find a new one every day, sneaking time as my kids play. I read ‘too much’ and seek more. Surprised my eyes are full and moist, it is me who I search for. Through my writing I am finding sometimes the truth is quite blinding. My children teach, never minding I record their family lore. I shut down my blog and play with them upon the kitchen floor. A mom of kids - nothing more. Outside now the snow is glistening through my blog others are listening. List’ning to words I have to say - humble stories of my day. Not searching for any drama, yet voters I did implore. Please think hard, make clear decisions, a world leader you vote for. My turn to speak - nothing more. Fingers tight with new frustration, children breaking concentration. A quick post of my vacation. I shut tight my blogging door. “If you stay true I write myself. I am abandoned on the shelf. Just read your friends.” The blog, it pleads to me through the office door. I return to my computer, ‘just to read’ and nothing more. It is not a daily chore. My post is funny, sends a laugh, my friends enjoy a recent gaffe. I find that it’s not nearly half the chaos of my life’s lore. The smallest laughs I am sending, they amplify never ending. The support my friends are lending – inspiring me to write more. If I forget my intentions, analytics keeps a score. Without friends, it’s just a chore. Now I’m writing ever faster, once again become the master. Thinking, writing, still learning more about this blog I adore. Inner struggle has stopped fighting, now I find my humble writing. Those words I cast upon the floor, stumbled now and read by more. My tiny fame surely over, a dot com asks me for more. Light sneaks through an open door. Success will follow she who tries - make a dollar maybe four. What the future has in store. Not just writing, I am flying, flying high - feet still on my floor. Unsure where these wings will take me, but I will knock on every door. Every day I’m learning, failing; start again, dreams I’m trailing. Not ‘just a blog’ - so much more. I wrote this as part of a contest. Check it out at Mabel's Labels site. Towards the end of my shift one night, around 2am, I shared a very strong cup of coffee with a long-time production manager. He was sixty something, African-American, and had decided that we had something in common. He had caught wind of the poem I wrote for my production line. This man, who had worked his way up from the lowest position in a dog food plant, loved poetry. In the shack – oasis – that was his well-appointed office, I listened to several of his heart-felt, well-written masterpieces. I did not have to pretend to be impressed. He listened to mine too. Still sipping my coffee, he offered me a few drops of wisdom, from his many years. He wandered a variety of paths during our conversation, but among the threads was the suggestion to listen to what every employee has to say. “Find the best in each one.” (In my poem, I had done just that). He said, with a wry smile, that sometimes those that appear least willing to work find the best efficiencies. I thought of him yesterday, as I pondered my organizational strategies. Based on his experienced logic, a woman who despises housework (yes, yes, that’s me!) should be capable of brilliance in the face of disorganized chaos. With that in mind, I bring you my heart-felt, “top-10” suggestions on how to manage some of the most unmanageable aspects of raising children. For our family, I find that the simple solutions are the only ones with staying power. 1. Shoes. 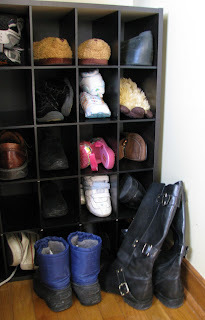 Four pairs of shoes and boots times five people . . . . buy a set of shoe cubbies. Buy one that is too large for your family, it will fill up. I put off-season items in a bin in the basement. 2. Hats/mittens/scarves/ugh. Searching for eight mittens in the few seconds before the bus arrives (before coffee) throws me into a tizzy. We have a few baskets to organize these items. To keep it simple, we have a “boys basket” and a “girls basket.” Nothing else is allowed in those baskets. EVER. I know, brilliant. 3. Play space. With a boy who is 6, a girl who is 4 and another boy who is 2 years, I think we have every toy on the planet: dolls, trains, legos, oh my! A few years ago, my house was completely out of control (now its only partially out of control). Since we could not afford a fancy basement re-finishing project, I decided to do the ‘bare minimum’ to allow my children the safe space they needed. With a $130 carpet remnant, $300 in shelves, and another $60 in bins and racks, my basement became playroom central. 4. Toy bins. The only toy bins worth having are once that the kids can put their own toys into by themselves. I let my older children help decide our organization strategies, but the categories are fairly obvious: balls, dolls, cars & trucks, little people, legos, dress-up, etc. Buy a bin that is slightly too large to allow for new toys in that category. 5. Dress-up. With a $10 rack and a yard sale mirror, a star is born! 6. Special toys. If your child has a particular love, find a way for that child to store those toys in a special place. These “garages” for my son’s “fragile cars” are a little too high for a two-year-old to reach, but well within his grasp. 7. School papers. My two older children bring home reams of paper every week. I put all of the papers in one notebook as they come through the door. I can do in the midst of chaos, and I can always find things by remembering approximately when that paper came home from school. For odd-shaped “precious art,” I keep a bin in the basement. 8. Hand-me downs. Kids grow SO fast, especially the little ones. I keep a bin (often a diaper box) in my kid’s closets. As soon as something is too small, it goes right in the bin. If it is too stained, throw it away! If you don’t have a friend with a smaller child, there are many organizations that would be thrilled to have your treasures. 9. The Children. 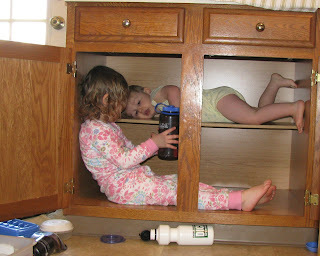 Don’t forget that by storing the smaller one on the upper shelf, there is plenty of room for a larger child on the bottom of the cabinet. 10. Take hints from others! Have an organization idea that works for your family? Share it!! Add your comment, or send me an e-mail and I will add to our ongoing list at mommy.mit@gmail.com. This post (or something frighteningly similar) will be posted on my site at Cleveland dot com. You can check me out over there, by clicking here. And, why did I start this post with the production manager? That production manager was very tough, hard-working, full of grace, and commanded respect from the inside out. He didn't control everything. He controlled what was important. The words were really never used as such, it was merely implied. Right. Well, that may explain why I have been blogging for seven months and hadn’t gotten around to mentioning it. Yeah, I’m pretty sure that’s why I hadn’t mentioned it. I have been told that people have never told their colleagues about their blog, because they just wouldn’t understand. No, more specifically, they would belly laugh (lol, right?). My reaction to that recommendation was similar to my reaction the day I was asked to bring a 15-inch reel-to-reel tape of data to a client on my bicycle. We all know how fast everything changes. . . . . and my gray line would appear. I made other programs from there, and even had the number codes for most of the colors memorized. It was SO cool. Not terribly useful, but definitely cool. It was no less cool when I wrote my first e-mail and even niftier when soon after we were able to send e-mails off-campus. I didn’t even mention it to my second manager, who had never even been on the corporate network. I found out from his really nice secretary who printed everything out for him. So, no, I’m not a psychotic shut-in. And, although I do not have my resume updated, in many ways this blog, in the future, may BE my resume. What else could anyone know, except for a static list of reasons of what I achieved. I achieved many things, mind you, but no one knew about all of the friends I made while doing it, all the personal lessons I learned. My resume looked just like everyone else’s, maybe less impressive (? ), until you interviewed me, asked the right question, and found out that what makes a person truly successful is HOW they achieved all of those wonderful bullet-points. The company survivies on the end product, yes, but those who get to that end product the correct way can achieve repeatedly. Those who don't, well, they have a bullet point to take to their next interview. I am proud of my days leading up to those bullet points. I am proud of this blog too. In many ways, this blog is like that gray line I saved on a cassette recorder “drive” when I was in elementary school. This is a part of my journey. But, now it’s not just my brother and I in the basement – learning a few things that didn’t seem useful – it is all my brothers and sisters out there enjoying this journey with me. And, yes, we are doing a LOT of kidding . . . tee hee hee. Do you think that is all we are doing? And, the toddler, theoretically unable to extend the generalization, will put the red marble in their mouth to determine if they receive the same reaction. The parent will thus repeat the recommendation, and the toddler continue this “testing” until they have exhausted all of the marbles, or, more likely, until they have exhausted the parent. As the mother of three, I can quickly debunk this theory. I have three kinds of children. I have a child like George, who will listen to your recommendation and likely refrain from putting anything else in his mouth ever (including food). I have a child like Gladys, who will find your reactions intriguing and change up the test by “testing” with multiple marbles at once. And, I have a child like Andrew, who will explain that he is merely practicing his oration skills and will convince you to buy more marbles and encourage the others to chew them as well. They are all perfectly capable of generalizations. In our house, like many houses, we have an “all food in the kitchen” rule. This means that my children are highly discouraged from wandering about with pretzels and bologna and cheese and other things that I might later find behind the piano. (This is not to say that I keep a pristine house, but rather that I have a distaste for cleaning bologna from behind the piano – especially very old bologna). Sunday evening in our house, like in many houses, we watched the Superbowl. This annual tradition brings with it food outside the kitchen. Yes, indeed, there were chips and dip in the family room.